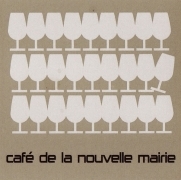 It may look like any other cute old Parisian café, but La Nouvelle Mairie is one of the best natural wine bars in town. It's also a pretty decent restaurant. There are fifteen to twenty wines chalked up on a blackboard, all available by the the glass, at little more than you would pay in a caviste. Staff are young, enthusiastic, and knowledgeable, and help to contribute to a pleasantly relaxed atmosphere. Owner Nico even makes wine himself. The ideal venue for daytime drinking. Closed at weekends, open late Tusdays and Thursdays.